A teenager's daily calorie needs are highly dependent on his size and activity level. However, general guidelines exist to give you and your teen a good idea of how many calories he should consume each day. Using an online calorie calculator will help you estimate your teen's individualized calorie needs. If your teen is inactive, he requires fewer calories each day to maintain a healthy weight than teens who regularly engage in physical activity. According to the Dietary Guidelines for Americans 2010, sedentary teen girls ages 13 to 18 need about 1,600 to 1,800 calories a day, while sedentary teen boys within the same age range require about 2,000 to 2,400 calories daily to maintain healthy body weights. Moderately active teens engage in daily physical activity equivalent to walking 1.5 to 3 miles at a pace of 3 to 4 miles per hour, and active teenagers exercise the equivalent of walking more than 3 miles daily at the same pace, according to the Dietary Guidelines for Americans 2010. 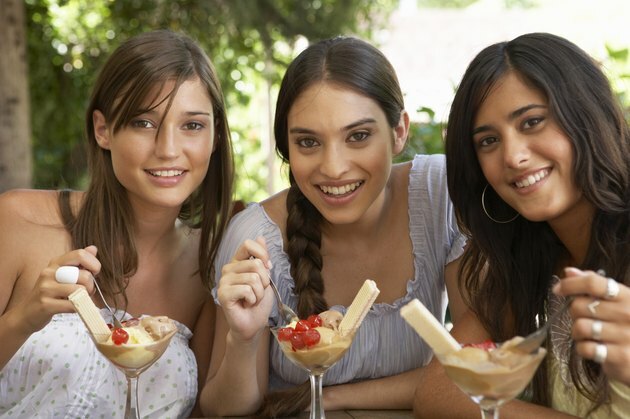 Moderately active teen girls need about 2,000 calories daily, while moderately active teenage boys require 2,200 to 2,800 calories a day to maintain healthy body weights -- and active teen girls and boys require about 2,200 to 2,400 and 2,600 to 3,200 calories daily, respectively. Due to the high demands of intense physical training commonly associated with middle- and high-school athletics programs, teenage athletes may need additional calories to excel in sports and grow and develop at a healthy pace. According to TeensHealth, some teenage athletes may require up to 5,000 calories a day, depending on how active they are. Eating well-balanced meals and snacks often -- and letting hunger be a guide -- is beneficial for adolescent athletes. Since specific age, gender, height, current weight and activity level all play roles in your teen's individualized calorie needs for healthy weight maintenance, using on online calorie calculator -- such as the U.S. Department of Agriculture's Daily Food Plan -- is often helpful. Using this tool as a reference, a 16-year-old teen girl who is 5 feet 3 inches tall, weighs 115 pounds and is physical active 30 to 60 minutes daily needs about 2,000 calories a day, while a 16-year-old teenage boy who is 5 feet 8 inches, weighs 154 pounds and is physical active 30 to 60 minutes per day requires about 3,000 calories daily. How Many Calories Should a Child Be Eating?